Young people settling in a new country face considerable change. Every day brings them new experiences and ways of looking at the world. They need time and space to learn a new language, embrace a bi-cultural identity and feel a sense of belonging. They also need to consider their futures: the skills they require to succeed within a new cultural context and how to strike a balance between what they like to do and are already good at. 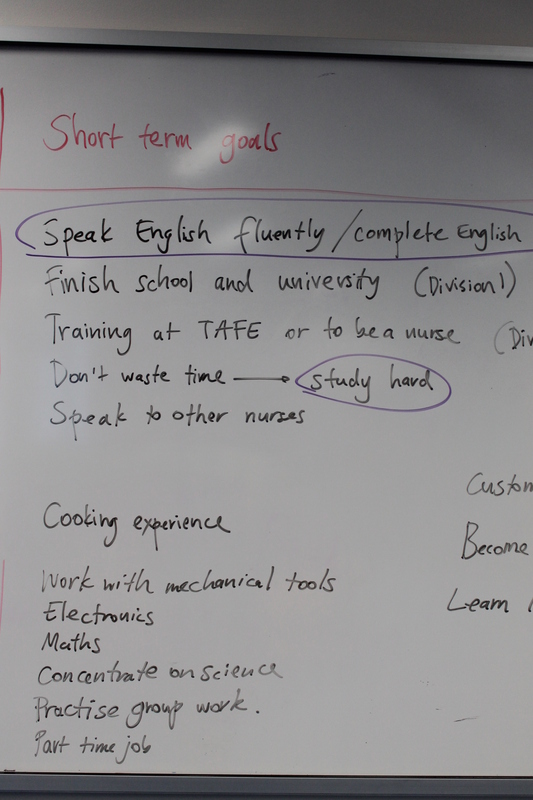 At The Huddle, we work with recently arrived teenagers, to learn the language of work and articulate aspirations. They imagine a future for them selves and plan towards making it a reality. 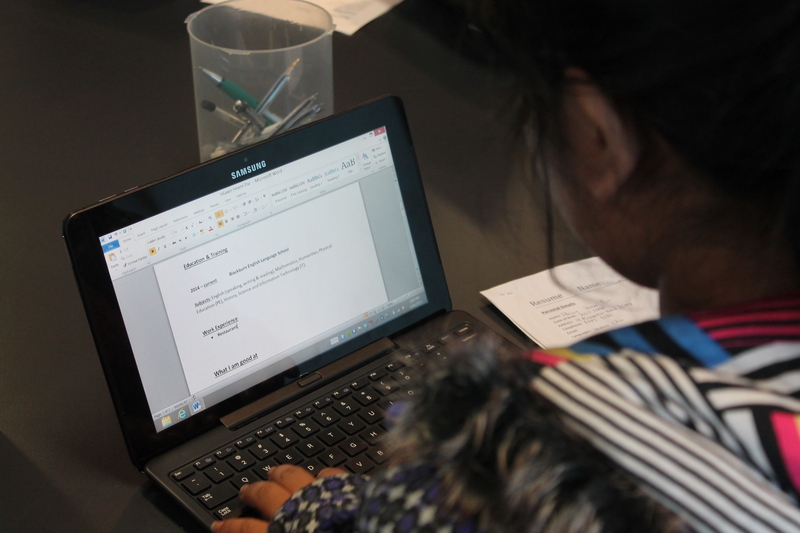 They consider the steps required to seek a part-time job and learn about the differences between skills, education, qualification, and work-based training. In a world this is increasingly globalized, young migrants should fare well – they are readily able to imagine working cross-culturally and internationally; they are flexible and accustomed to change; they are bilingual; and from my observations, they have a strong sense of citizenship and desire to help others. Author maireadhannanPosted on April 9, 2014 June 10, 2014 Categories education, Language learning, TESOL and bilingual students, The HuddleLeave a comment on 2014 – a great start to the year! Last year, two young women involved in The Huddle’s Study Support Program were awarded scholarships by NMFC group ‘Inspire’, to support them with their studies. Shamso, a newly arrived migrant from Somalia, was one of the recipients and has used the award to support her studies in Year 10 at a local secondary school in Footscray. Shamso has a most gracious presence in The Huddle. She is open, loving and thoughtful. She has moved here to live with her aunt and plans to study nursing. For now, she is working at acquiring English language and literacy skills and learning where to focus her efforts within a new education system. She is settling well into Australian society and is very grateful to be supported to achieve her best. In October this year, thanks to the women of Inspire, further scholarships were awarded to female members of The Huddle community – read about it on the NMFC website and hear how they will benefit from this wonderful opportunity. 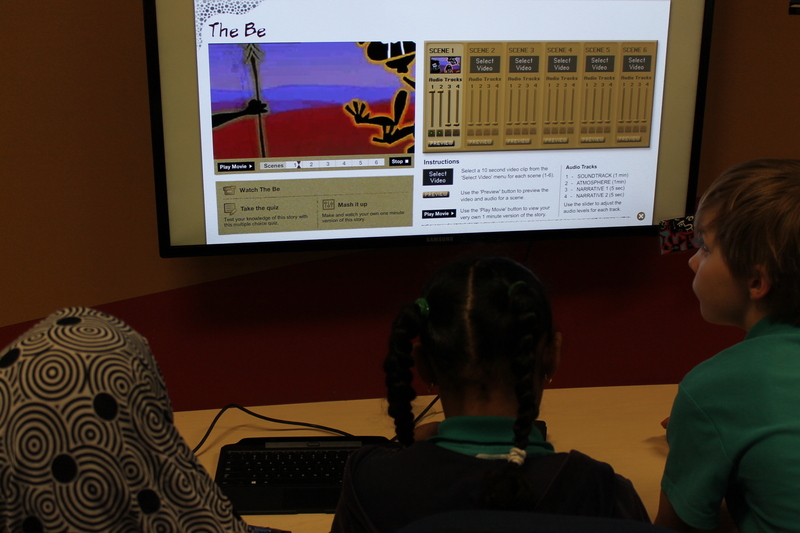 The Traditional Stories program at The Huddle develops language and literacy skills in primary aged students through stories from Arnhem land using multimedia and video. 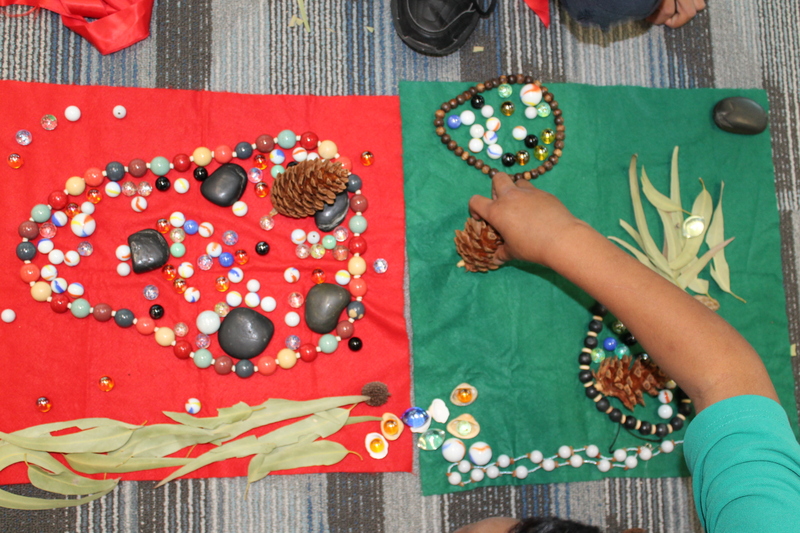 Students view stories from the ABC’s Dust Echoes and practice retelling them using props such as scarves, felt, shells and rocks. The props help them to abstract meaning and the essence of each story and then focus on the language, narrative form and performance. Working in groups, they collaborate to learn the story by reading it aloud, viewing it, taking a quiz and doing a mash up on the Dust Echoes website. This tunes them into the language, music and sounds they might choose before they attempt to retell the story with the props. 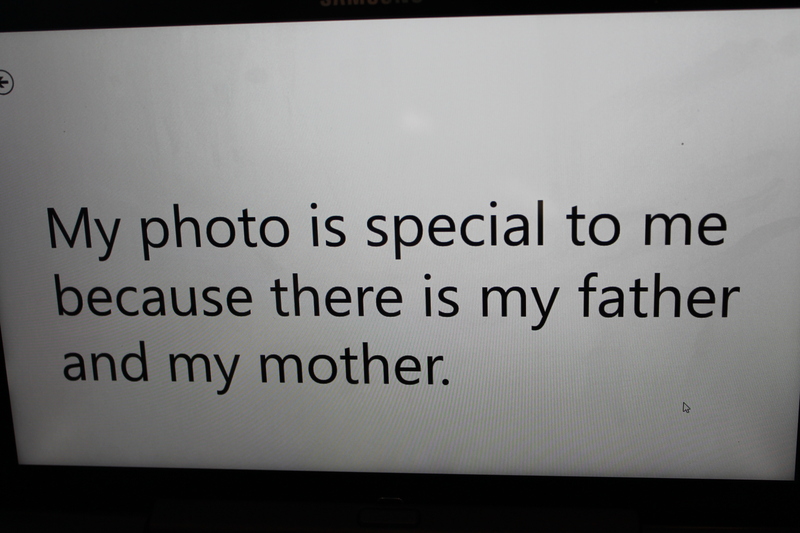 Once the students have rehearsed the storytelling, it is then recorded on video as a performance to be shared at a later date. After their renditions of the story, they are readily able to lead a discussion around the community values, morals and learning from the story. They build intercultural understanding and discuss their own values as well as making connections to their own cultures and experiences. Over the past few weeks at The Huddle, we worked on a creative project using the NMFC club song “Join in the Chorus”. We asked a group of students to create a lip sync video collaboratively, based on “Join in the Chorus”. art production – enhancing the visuals and setting to be filmed. Using Samsung Slates, art production was probably the most creative role. Instead of sourcing props and costumes, this role involved drawing on the screen with your finger or a stylus to animate the video and enhance the visuals around the person being filmed. The Samsung camera allows you to draw your own pictures on screen and then shoot; or to use preset frames, filters and animated emotions – or a mixture of both. Given some roles carried a heavier workload than others, students were able to rotate through roles and gain a fuller experience of film-making. The acting role was somewhat challenging and could be done in a group, which would have the potential to make reference to the team singing the song after they win a game. Though we talked at length about how to make editing easy, probably the hardest aspect of the activity is to edit the song together so that lip sync is achieved. 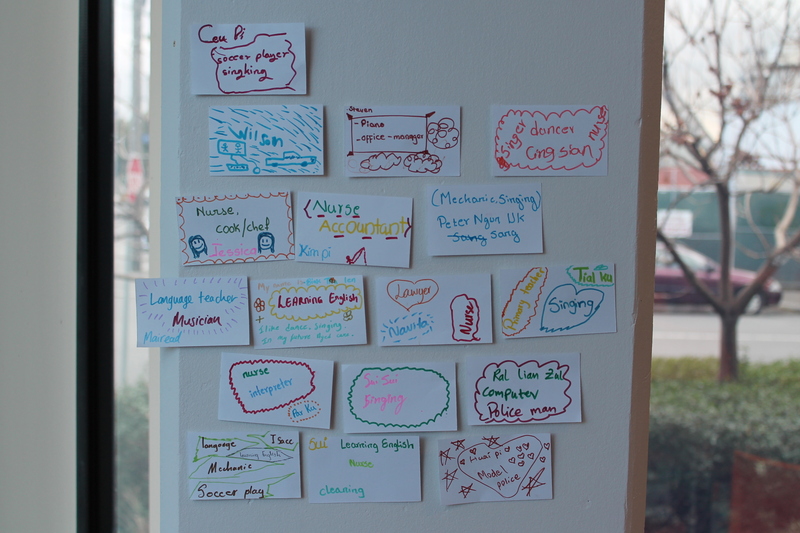 So we have more thinking to do with the editing process and applications that might suit this activity. 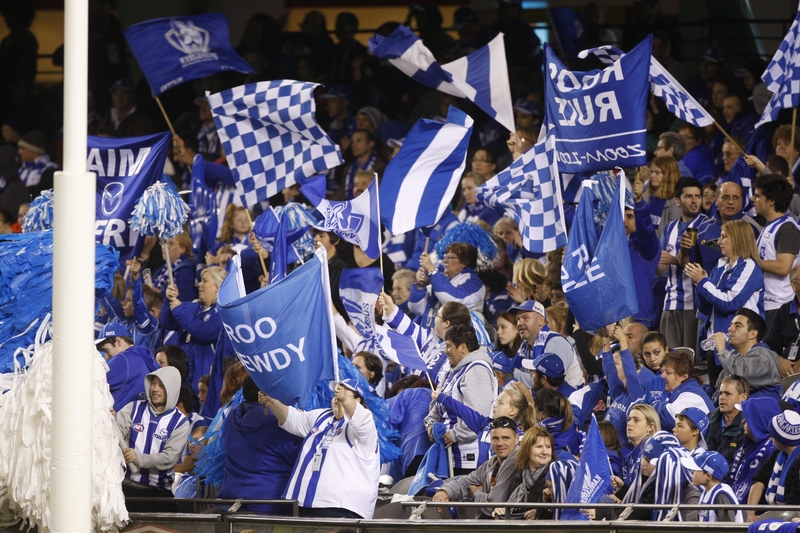 AFL club songs are great and I love “Join in the Chorus” http://www.nmfc.com.au/video/2013-06-02/join-in-the-chorus. The lyrics are rousing, joyous and speak to the heart – making all True Roos feel proud to belong. But the beginning of the song which the players sing at the end of matches, is not recorded in the official release of the song, so it doesn’t present an opportunity for lip syncing http://www.nmfc.com.au/fans/multimedia/theme-song. 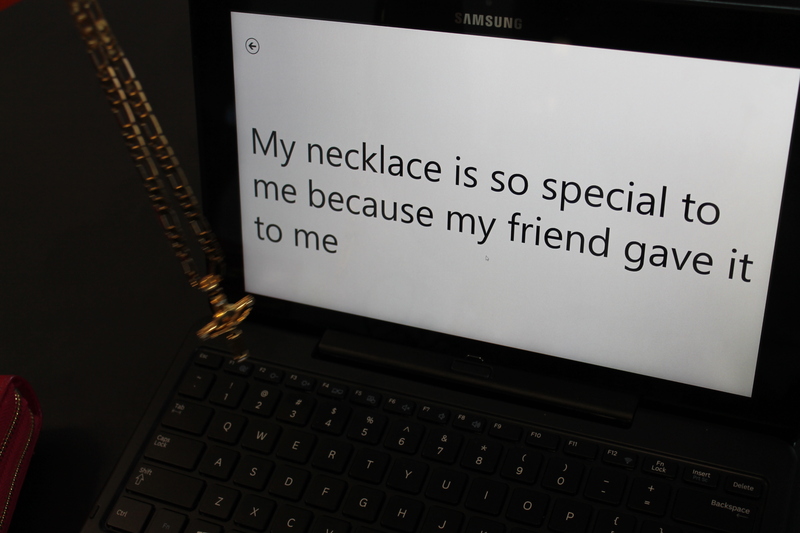 After we ran the activity, we wondered whether we should ask students to video a rendition of the Hearts to Hearts verse – we may try that another time! The best thing about the whole activity, is that it just made us laugh. I still laugh watching and thinking about it and I loved the way the students had fun with this and threw themselves into it. This week at The Huddle I hosted a group of students from an English Language Centre for newly arrived young people in Melbourne. 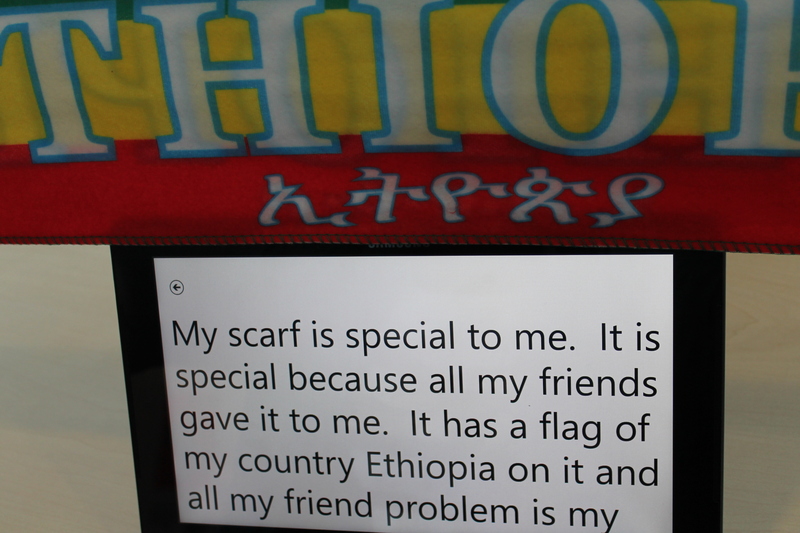 We worked on language describing objects and memories and each student made a poster on the computer about something they remember from their own country or their past. To get the ball rolling, I made a set of props available – beads, rocks, leaves, shells and other natural objects. 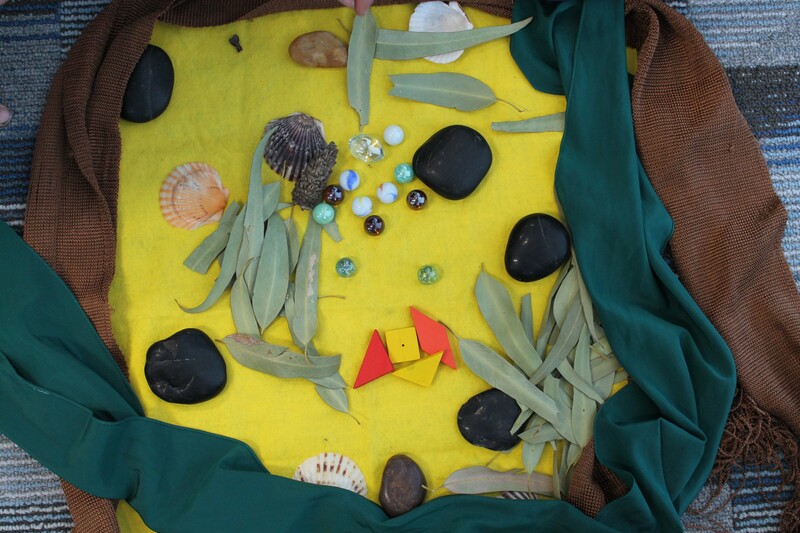 We described these – colour, shape, feel, weight, use, smell, sound – and then explored the memories that came up for everyone around their chosen object. The students had precious memories of playing with rocks on the dusty ground or finding them in rivers; of their grandmothers or elders who wear or count beads; of the scarves and cloth worn by men and women in their home countries; of the smell of gum leaves and the fact that they are used as a whistle where they used to live. These memories seemed to make them feel happy, included and build a connection and sense of belonging at The Huddle. They went on to make posters reflecting their memories using Comic Life software. The computer is a medium they were clearly not experienced in but they were so eager to make the posters that the technology didn’t pose any barriers! 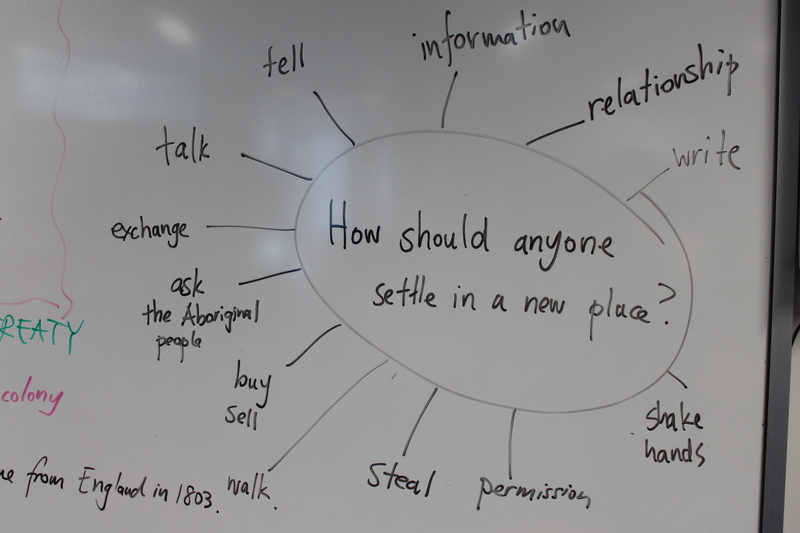 I found this a useful way of creating a safe space for personal stories, promoting student voice, building language around memory and integrating technology into learning in context – in a meaningful way where students led the process working individually and with each other. I hope link to some samples in due course. Finally, The Huddle won a national award this week for Sports Leadership as part of the Migration and Settlement Awards 2013. The work we do at The Huddle includes building belonging and identity through sport, innovation, education and storytelling. 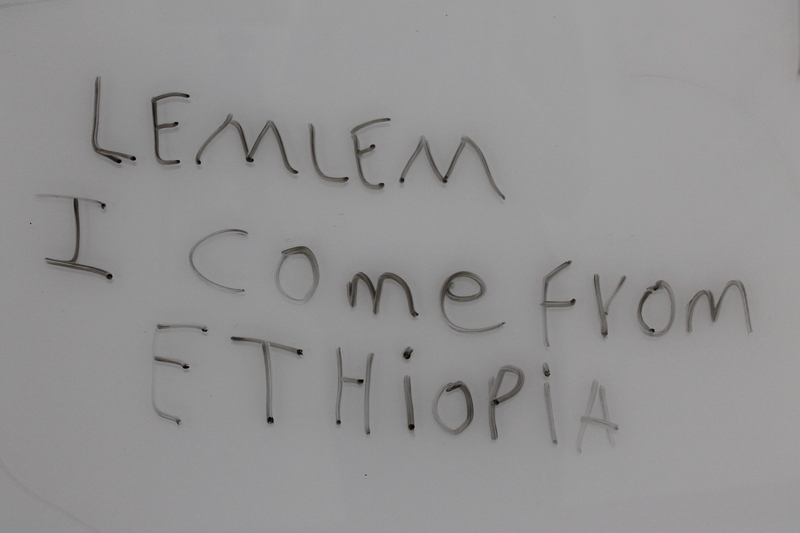 This is one example of the many things we do at The Huddle with recently arrived migrants.